Is technology boon or a bane? I bet this question would provoke a strong assertion of “Of course, technology is definitely a blessing for mankind!” After all, the modern world is dominated by people who are addicted to the multiple products of technology and its manifold applications in daily life. And I expect educators, heads of academic institutions, students as well as learning communities to put on their thinking caps prior to responding to this one, please. Let me offer you a quick hint that would assist you in coming up with an honest feedback. Listen to this question carefully before you answer it. How many times have you discovered yourself frowning at your pupils when they take a sneak peek at their cellphones during your lecture? I am pretty certain you have often caught a few pupils red-handed, texting under their desks while a History lesson is in full swing. If the number of times you have interrupted students while they’ve been meddling with mobile phones inside classes have exceeded thrice, I’m afraid you are a victim of excessive utilization of cellphone technology inside classes. Why Teachers Must Manage Cellphone Usage in Classrooms? Okay, let us be more realistic. Not every school permits educators to confiscate the personal mobile gadgets from learners. In such circumstances, teachers have little choice but to be polite and employ the tool of ‘patience’. Now the question is, are course instructors really successful in dissuading their pupils from reaching for their favorite electronic appliances every now and then? You might hasten to blurt out that your school follows a strict decorum in terms of cellphone policies. Having said that, here goes the bitter truth: a large number of students inside school classrooms have their mobile phones in their purses and pockets. So, it is absolutely ‘not so cool’ to pretend that your students obey the cellphone restrictions while they are inside the school premises. Rather, educators should strive to transform these cellphones into the some of the most efficient learning tools that aid in a sophisticated teaching approach. 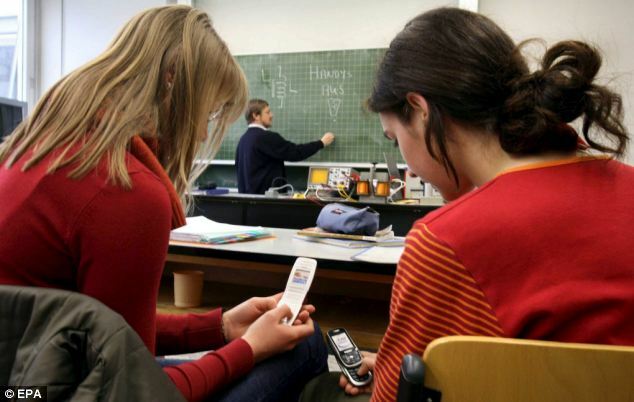 Let us unearth some of the steps to manage the use of cellphones in the classroom. First of all, I would advise all teachers to make sure your rules regarding the usage of cellphones in the class are loud and clear. For instance, you should communicate to your students quite clearly that you would not entertain any pupil reading their text messages during a classroom session, be it lectures or any other activity. They should be aware that they are not entitled to enter the class with their mobile phones switched on. However, when certain lessons require your students to rely on employing certain educational apps that are available on their cellphone devices, you can give them a green signal. In such situations, you should write the following words in bold letters across the blackboard: “You can use your cellphones now.” But once you do so, you should observe carefully if your pupils still use their gadgets after a particular session involving technology has been concluded. Next, stop treating the mobile phones of your students as if they are forbidden fruits. Instead, schedule a meeting with your class exclusively for the purpose of explaining them the most creative ideas of managing their cellphones during school hours. For example, you can teach your students how to go on virtual field trips with the assistance of some interesting websites – through their cellphones. And remember to be gentle and polite, as you go about this task. Your learners should be convinced that they are capable of utilizing their personal cellphones beautifully for meeting their academic requirements. Avoid scolding them or losing your temper in front of your schoolkids, for it would make matters worse for you. When they realize that there is more to mobile devices than merely exchanging messages, making calls, or clicking pictures, they would certainly be curious to learn how they can be used as learning tools. Are the cellphones the major culprits responsible for triggering widespread distraction among your pupils? I have a nice idea that can help you get rid of this issue without coming to loggerheads with your pupils! Ask your students to hand over their cellphones to you before they appear for an examination in the class. Now, store them neatly in a phone cubby near your desk. This would check the tendency of students to resort to unfair means with the help of these gadgets during their exams. On the other hand, it would also ensure that these expensive devices are really safe in the class while the students are writing their exam. Repeat this process even when the students are completing an assignment in your session, or participating in any activity like class discussions, quizzes, or debates. It would improve their concentration skills to a great extent. In addition, it would also make them more productive in their academic performance. How many times have you observed that your students are willing to share their textbooks with their partners in a classroom? Well, if you are yet to notice it, please do that immediately. You should not leave any stone unturned in developing the habit of sharing among your students. Therefore, when you notice that some of your students lack the necessary technological products essential for education, ask the ones with cellphones to share them with the classmates. So, you need not worry if half of your student populace are deprived of mobile devices in the class. Dear teachers, you should understand that this policy of making kids share their belongings with one another would promote a spirit of collaboration within them. And as you already know, this would contribute to making them more cooperative and generous! Moreover, this practice would also groom them for working in group projects or assignments in future. So, the sight of mobile headphones on your students has been repelling you lately, right? If your students are yet to be persuaded about using their cellphones as learning tools, here is what you can do: inform them about educational apps. You should be knowledgeable about the brand new apps that are associated to education and explain about their applications in the classroom. This aids students in two ways. It enhances the technological literacy among teachers as well as students. Students are able to analyze their subjects and different ideas more innovatively, using their critical thinking prowess. And for both of these, they need your permission to use their cellphones during your sessions. Very soon, you would discover your students offering you important suggestions regarding the apps that would be the best for studying a particular subject. Also, it would finally be clear to your learners that mobile phones are capable of motivating them to learn their lessons swiftly. Most students tend to get quite bored listening to lectures and try hard to stifle yawns. Another issue is that students who might be unable to attend schools might end up missing significant lessons delivered in the form of lectures. How can teachers come to the aid of such students? While you explain about any theory, ask your students to record it in the cellphones. Audible notes are remarkably flexible. So, students would hardly confront with any complications while replaying the podcast later. Doing this would save teachers a great deal of time, as they wouldn’t have to repeat the same lecture more than once. Also, it would work wonders for auditory learners, as they simply learn better when they are exposed to audio clips and recordings. Furthermore, subjects like Economics, History, English and others that cannot be explained through visual illustrations appear more exciting to students when they are recorded. This isn’t that uncommon, is it? I am sure you already knew this. Yet, you might not have opted for this while teaching in the classroom. Have you ever asked your students, whose use of cellphones in the classroom been bothering you, to utilize it prudently? You can surely ask them to access books online through their mobile phones. Yes, I am talking about e-books. And you must have already downloaded and read many of them. Why not instill this habit in your students as well? You can ask your students and guide them how to use the Internet to enjoy access to certain e-book versions of their textbooks. Well, a good idea would be to inspire the learners to use these books as references to their school textbooks. I have come across some schools that maintain online libraries. This would make it even more convenient for you and your students to access several books that are otherwise not available. You should encourage students to purchase these books (that, of course, do not include the books of the school library, but involve the e-books provided across different websites). Students would also be capable of reading these books anytime, anywhere, if you inspire them to use their cellphones for educational purpose. The best part about cellphones is that they do not require a constant charge unlike laptops, tablets, and other such electronic gadgets. If you have more ideas about how to manage the usage of cellphones effectually in learning spaces, please share them with us in the comments section provided below.